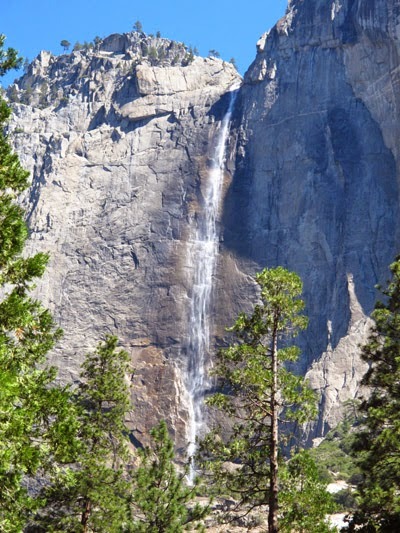 Flowing waterfalls and abundant hiking trails are big draws for visitors to YosemiteNational Park in northeastern Mariposa County, California. As one of the most beautiful places in the world, Yosemite has a great variety of opportunities to admire nature at its finest. During a recent visit, we also participated in a couple of tours that may be under-utilized but which allowed us to enjoy different aspects of what the park has to offer. On our first morning in the park we took a photography tour guided by Christine, a ranger/photographer who absolutely loved being in the park and sharing spectacular views with visitors. Leaving from Ansel Adams Gallery (be sure to peek inside at the beautiful works of art there) near the Visitor Center, we spent an hour and a half walking through Cooks Meadow. 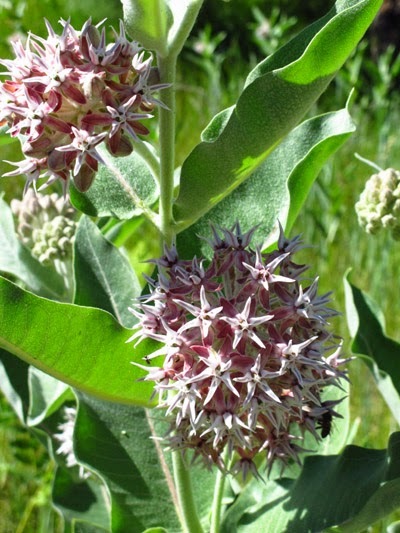 Noted as the best place in the park to see wildlife—mostly towards sunset—the meadow was sprouting with a variety of wildflowers and grasses in early July. Our first look at Upper Yosemite Fall. Since we had arrived after dark the night before, this meadow walk yielded our first views of famous Yosemite Falls and Half Dome. Christine knew the best places to take pictures, and directed our attention to scenic spots. The Falls were flowing in a steady but thin stream, but because of little snowfall during the winter, Christine estimated that they would be dry within ten days. During our five-day stay, we watched the water level diminish, although it was still flowing somewhat when we left the park. The free tour follows an established, level path and is suitable for most people. Take water, as the Valley can be hot during the summer. In the evening we chose the Glacier Point Stargazing Tour, which left at 7:00 and returned around 11:00 p.m. We rode a bus for the hour-long journey to Glacier Point passing forests of California black oak trees and the slow-moving Merced River (again from lack of snowfall). We saw wind blow remnants of Bridal Veil Fall and viewed Fern Spring Fall, the smallest waterfall in the park at just 18 inches—but it runs year round. which are still flowing well. 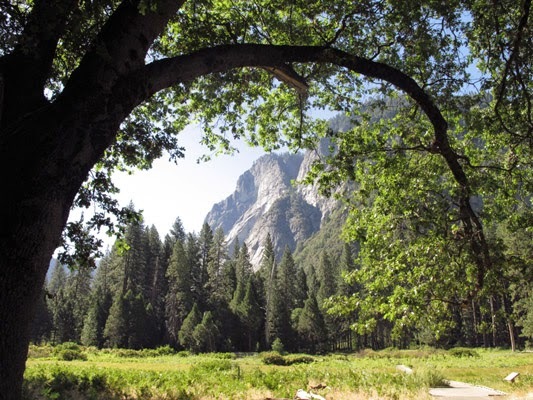 Reata, our driver, provided narration of Yosemite's diverse natural and cultural history. She pointed out the original stagecoach road and told how stages going up had to dismantle and move aside so the one going down could pass on the narrow road. 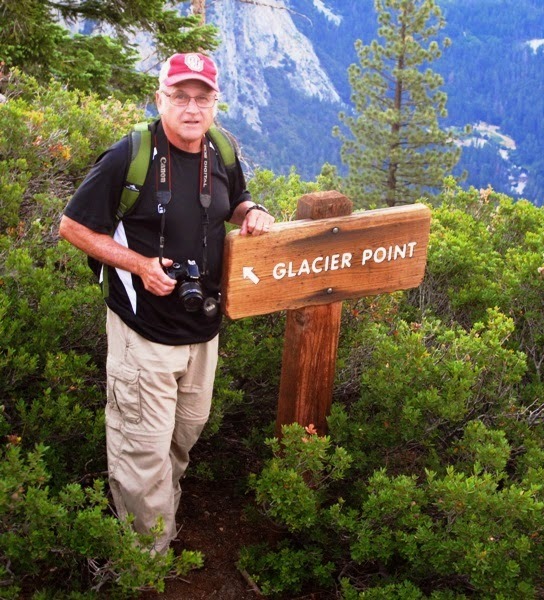 We learned about the efforts of Gaylen Clark to have Yosemite named a national park, about fires in 1990 that closed the park for 10 days, and about animals that inhabit the park. 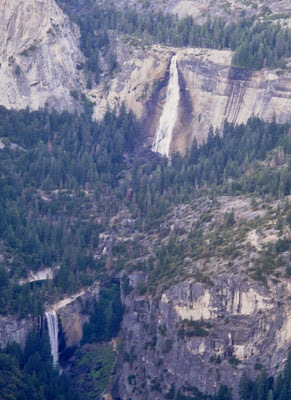 Upon arriving at Glacier Point (after a series of sharp turns and switchbacks) we wandered for 45 minutes admiring views of mountains and waterfalls. As darkness descended, our group gathered at the amphitheater for an hour-long program by Jennifer, a ranger and astronomy expert. She told stories from mythology on how the constellations were created and used a laser to point our specific stars. 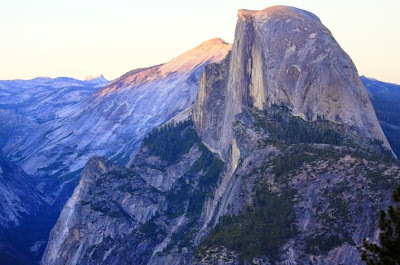 Shooting stars streaked across the sky several times, and we saw lights on Half Dome and by Yosemite Falls, possibly from hikers or rock climbers spending the night on the boulders. As the sky went from dark to black, stars popped out brighter and clearer that I’ve ever seen, and the Milky Way spread across the sky. Without light pollution interfering with the view, we could appreciate how glorious the universe really is—and how infinitesimal we humans are. Actually, all of Yosemite is a lesson in humility--and respect for nature's enduring landscapes. Make prior reservations for this tour, which costs about $40. Thanks for sharing. Yosemite is a wonderful place.